GreenRoad’s in-cab display gives fleet drivers objective, real-time feedback whenever a risky driving event occurs. Simple audio and visual feedback helps fleet drivers quickly self-correct without being distracted from the road. And at the end of every trip, an automatic summary displays the trip safety level and other stats. 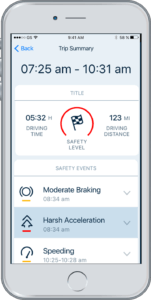 Setting up GreenRoad’s powerful real-time, in-vehicle coaching is as easy as downloading our fleet management mobile app. 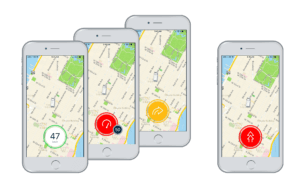 Our application works with the advanced technology in your mobile device to recognize different fleet vehicle types from heavy trucks, buses and construction vehicles to light delivery vehicles, trucks, cars and vans. Get your drivers connected and out on the road in just a few clicks. With our fleet management software suite of reporting and analysis capabilities you can easily access safety scores by driver, trip, or organizational unit. Use this information to determine where you can apply objective feedback and training to improve fleet driver behavior company wide. Our easy to install technology instantly helps drivers improve while helping you collect actionable data. If mobile capabilities aren’t an option for your organization today, click here to talk to one of our experts about how we can help with an in-vehicle hardware solution.